On that fateful day, September 11, 2001, President George W. Bush was visiting a reading class at the Emma E. Booker Elementary School in Sarasota, Florida, right before his aide whispered in his ear that a second plane had hit the World Trade Center. Teacher: “Let’s read these words as fastly without stopping without mistake. Get ready!” — teacher points at a word. 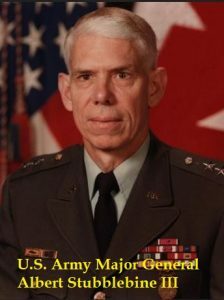 The teacher then instructs the students to open their books, when Bush’s chief of staff Andy Card walks in, bends down and whispers in his ear . . . .
Albert Stubblebine III (February 6, 1930 – February 6, 2017) was a United States Army major general whose active duty career spanned 32 years. Beginning as an armor officer, he later transferred to intelligence. 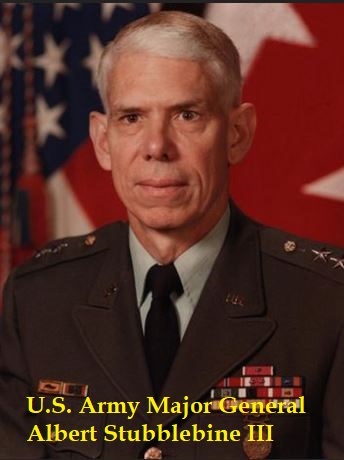 He is credited with redesigning the U.S. Army intelligence architecture during his time ascommanding general of the U.S. Army Intelligence and Security Command (INSCOM) from 1981 to 1984, after which he retired from active service. Stubblebine: “Well, for one thing, if you look at the hole that was made in the Pentagon, the nose penetrated far enough so that there should have been wing marks on the walls of the Pentagon. I have been unable to find those wing marks. So where were they? Did this vessel, vehicle, or whatever it was have wings? Apparently not, because if it had wings, they would have made marks on the side of the Pentagon. One person counteracted my theory and said, ‘Oh, you got it all wrong. And the reason that it’s wrong is that as the airplane came across, one wing tipped down and hit the ground and broke off.’ I said fine, that’s possible, one wing could have broken off. But if I understand airplanes correctly, most airplanes have two wings. I haven’t met an airplane with only one wing. So where was the mark for the second wing? Okay, one broke off; there should have been a mark for the second wing. I could not find that in any of the photographs that I’ve analyzed. Now I’ve been very careful to not say what went in there. Why? Because I don’t have that evidence.